Please turn on this option to see admin menu customizations. This option can be used to turn off the admin menu customizations in a case on any potential issues, or while the customizations are in progress. You can hide top menu items as well as sub menu items when you click on the "eye" button on that item. To edit a default menu item, click on "pencil" icon on that item. It will open that item in edit mode. This works for both top items and sub menu items. 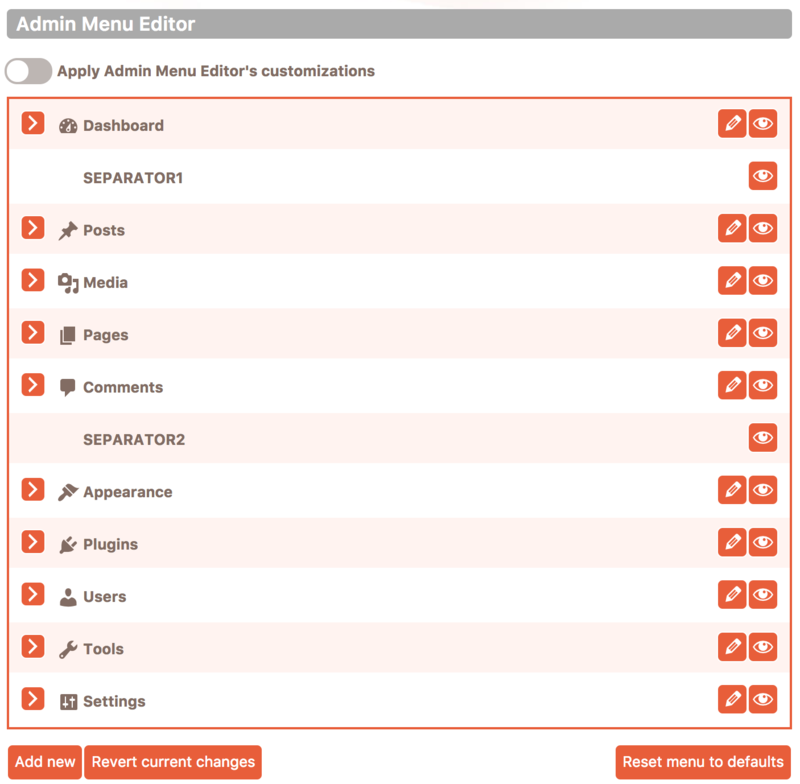 The button under the Admin Menu Editor will create a new top menu button and append it to the end of the menu. To add a new submenu item, expand the top menu item under what you want to add a new sub-menu item and click on Add new button there. It is possible to remove only the custom created admin menu top and sub items. For the default WordPress menu items, it's only possible to hide them, not to remove them completely. From the user's perspective, this is pretty much the same, in both cases menu items will not appear in the menu (not even rendered in HTML). The default items are not removable because at some point you may change your mind and want them to be visible again. 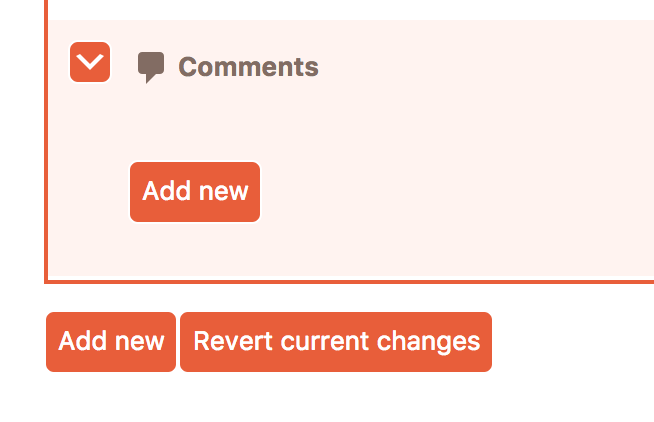 Since these are commonly used buttons, it makes more sense to just hide them, instead of removing them completely from the Admin Menu Editor. To delete a custom created top and sub-item, click on X button on it. This will remove them completely from the menu and Admin Menu Editor. This action is not reversible after applying the settings. While you're making your changes, sometimes you make a mistake and don't want to apply that customization. If that happens, just click on this button and start your customizations again, from the last saved customizations. This option will clear all your admin menu customizations and will revert the menu to the default WordPress settings. Top menu items as well as sub menu items, can be easily reordered by drag and drop. Just make your custom order and hit master Apply button. Separators are small spaces that are set in WordPress by default in some places on the admin menu. By default, you will notice that there's more space between Dashboard and Posts menu item and also between Comments and Appearance. In Admin Menu Editor, you can hide these separators. Once you're satisfied with the settings, click on Confirm changes button to save the changes. This will close the edit mode and return to the Admin Menu Editor. Changes will stil not be saved until you click on master Apply button. If you're not satisfied with the results, you can click Cancel to return to the Admin Menu Editor without making changes. This will change the text of any top/sub items including custom and default items. Add your custom URLs for custom items. The URL of the default WordPress items cannot be changed. If you don't want those items, just hide them and create new items. Set your preferred capability for this menu item. Only users that have the selected capability will be able to see it. Use "Read" capability to make it visible for all users. If you still use Cusmin hide option on this item, even though the "Read" capability is set, it will not be visible. This option is supported for all menu items. 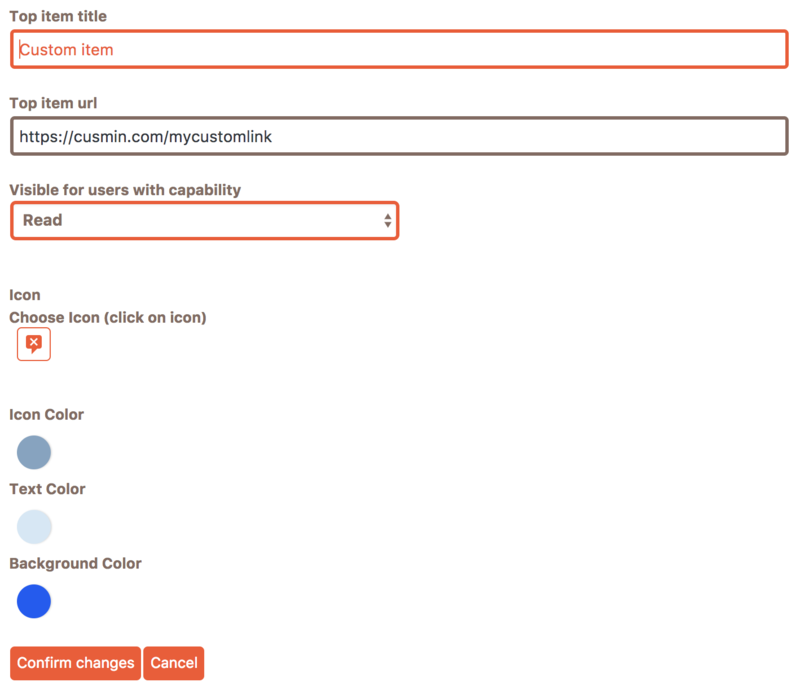 Click on this option to change the icon of the default WordPress top items or to set an icon for your custom top items. The icons can be set for the top items only. You can change the top menu icons with custom icons. In editing mode just click on the icon box, and icon picker popup will show up. 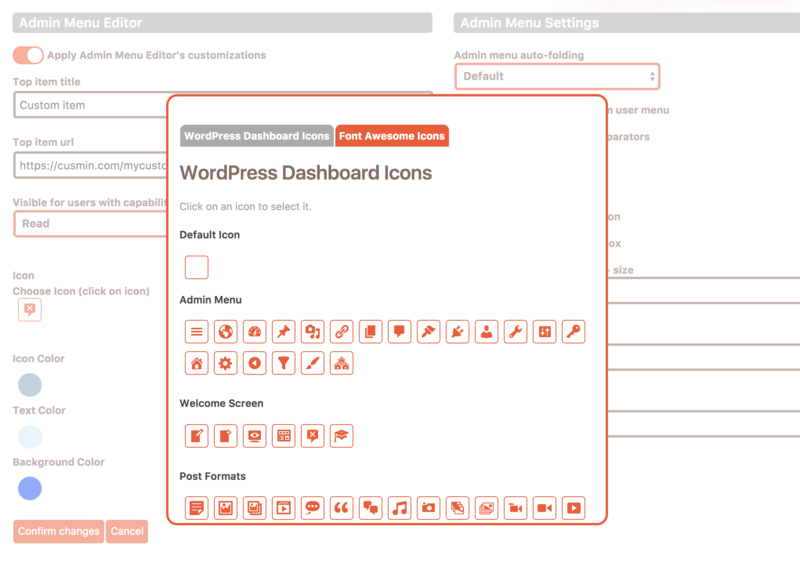 By default, it opens WordPress Dashboard Icons tab, where you can choose any icon from the WordPress Dashboard icons list. 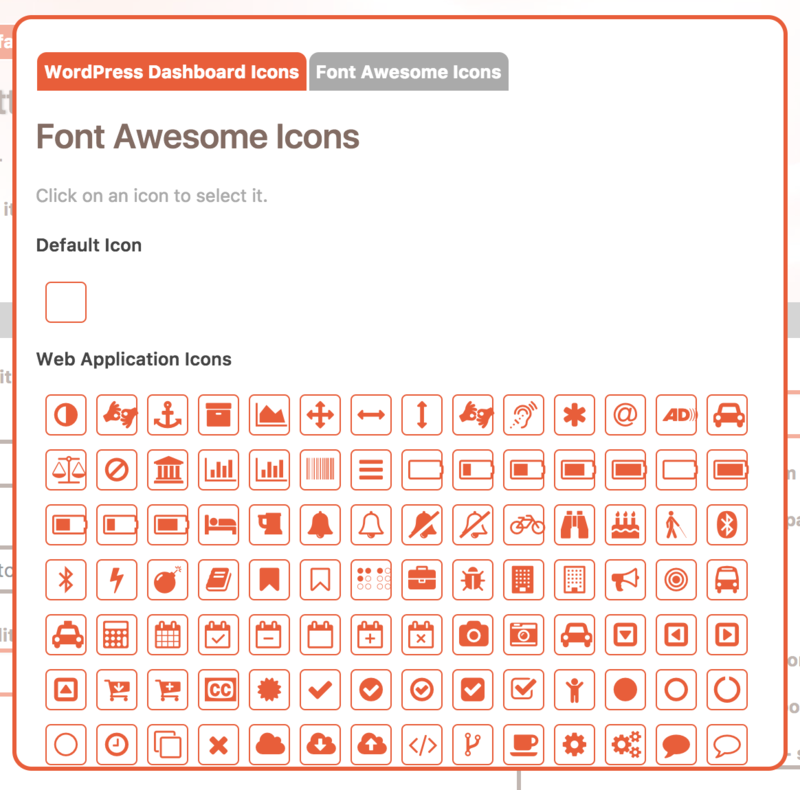 Click on the Font Awesome Icons tab to show up the Font Awesome Icons list. To view all icons, please scroll down. There are in total 860+ different icons you can choose from. Just click on any icon you want to select it or click away to cancel. To clean up your custom settings click on "Default Icon" option. This will set the default icon for the default WordPress top menu items, and it will clean up the icon for your custom top items.